In a medium saucepan, bring the ancho chili peppers, vegetable broth and 1 cup water to a boil, then simmer for 20 minutes. Meanwhile, in a soup pot, heat the EVOO, two turns of the pan, over medium-high heat. Add the onion and garlic and cook until the onion starts to brown, about 7 minutes. Stir in the currants and tomato paste for 1 minute. Add the beer and cook until reduced slightly, about 1 minute. Stir in the black beans, cumin, coriander and cinnamon; season with salt and pepper. Using a food processor, puree the ancho-broth mixture. Stir into the black bean chili and simmer over medium-low heat until thickened, 3-5 minutes. Rinse out the food processor and add the avocado, sour cream, cilantro, lime peel and lime juice; puree until smooth. Ladle the chili into bowls and top with the avocado cream. Serve with the tortilla chips. In Recipes-list.com we have selected the most viewed recipes from category - uncategorized . Enjoy the best recipes specially selected for you! 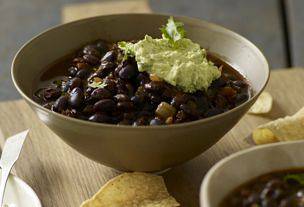 Ancho-Black Bean Chili is the right choice that will satisfy all your claims.